Education Reform is the focus of the National Forensics League's 2017-2018 Policy Debate. Articles will discuss different strategies in reforming primary and secondary education in the US. American students do not rank well compared to their peers in other countries. Every administration aims to improve education through a variety of means-increased regulation, funding, standards review and teacher professional development. How has the adoption of the Common Core State Standards changed the national education landscape? Is reform still needed? How do we address the persistent achievement gap between ethnic and racial groups? What is the role of for- profit charter schools in improving failing public schools? Is a skills-based education the best for training a 21st century workforce to compete globally? What is the role of technology in improving teaching or learning? Will online K-12 education address accessibility and fairness in education? 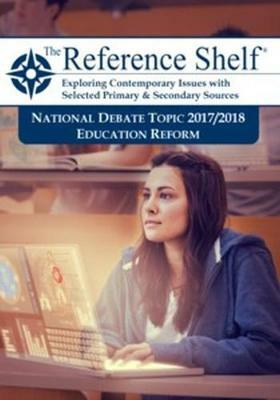 This volume will cover all the current issues in the debate on education reform including teacher training and pay, class size, flexible scheduling and standardized testing.